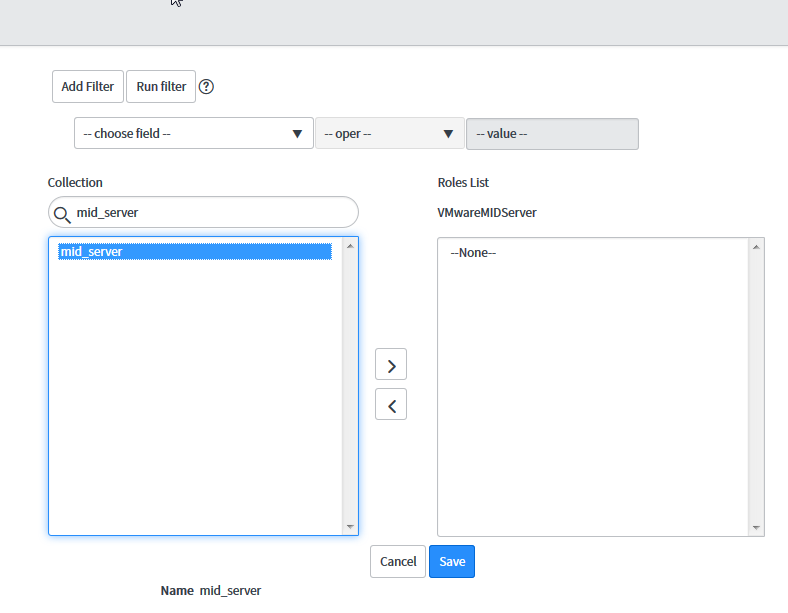 In this article we will take a look how to configure The vRealize Automation plugin for ServiceNow . The Plug-in enables ServiceNow users to deploy virtual machines and perform day 2 actions on CMDB resources using vRealize Automation catalog and governance capabilities. 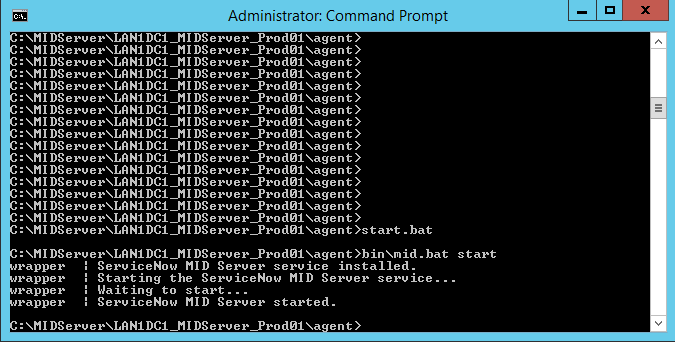 Installing and Configuring a MID Server instance. This is Part 1. If you have already completed it go to Part 2. The full lab logical design can be seen HERE. 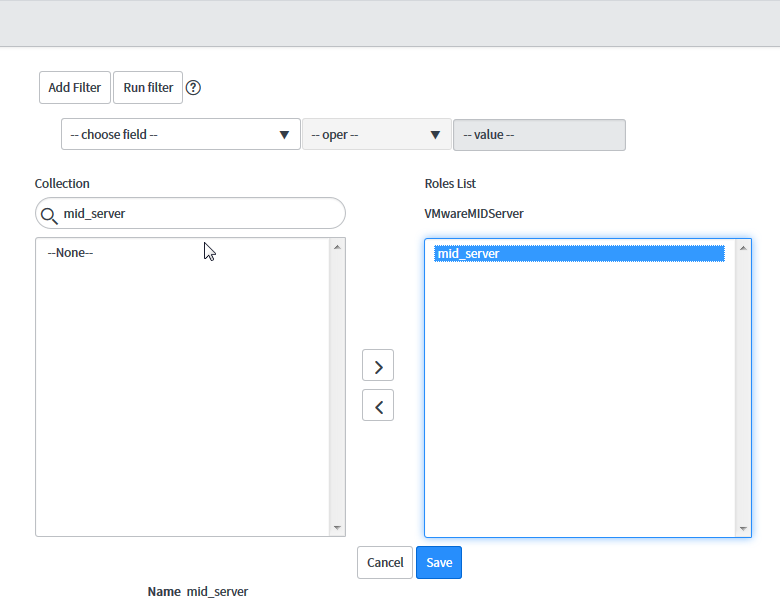 This section covers how to configure a Management, Instrumentation, and Discovery (MID) Server to facilitate communication between ServiceNow and vRealize Automation. 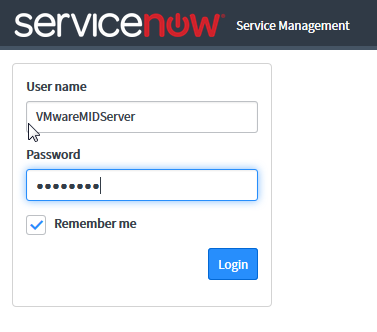 Log in to your ServiceNow portal. In the search field type System Security server. Navigate to System Security > High Security Settings > Users and Groups and select Users. Click New to create a new user account. Fill in the user information and click Submit. In the users search filed, find the user you’ve just created and select it. Select the Roles tab and click Edit. Select the mid_server role from the collection list and add it to the user account. Enter a password for the user account and click Update. 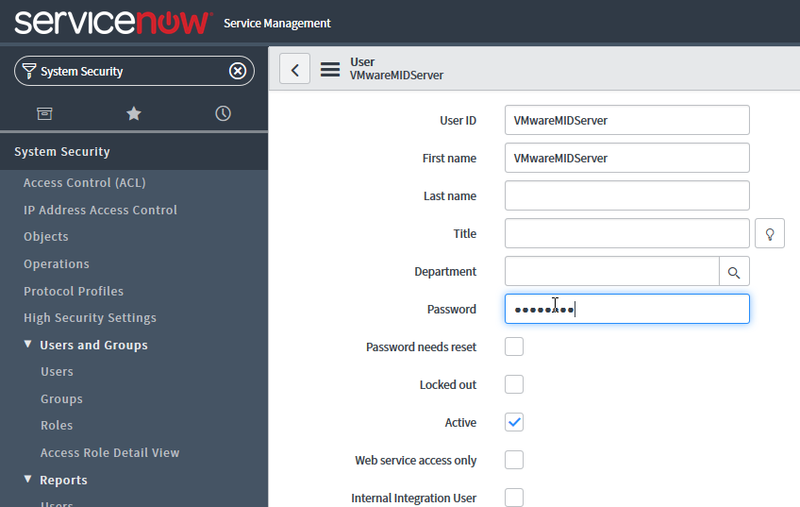 Log off from the ServiceNow portal and login with the MID Server user you’ve just created to verify the credentials are working properly. . 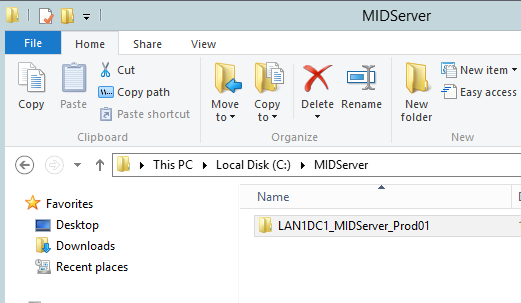 This section covers how to install and configure a MID Server instance. Select and download the MID Server for the appropriate operating system. Note: In this example, I’m installing MID Server on Windows. 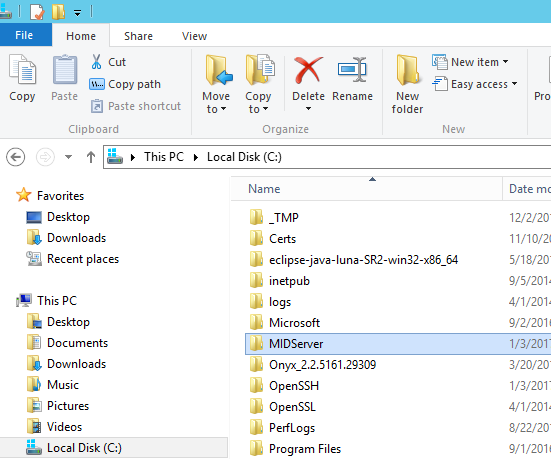 Create another directory within your installation directory and name it accordingly to specify your MID Server name. 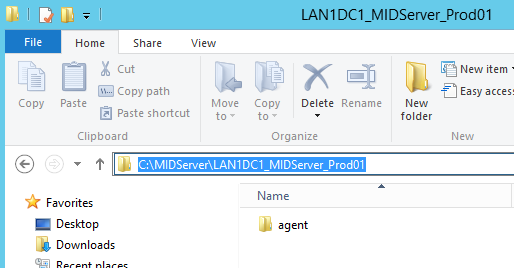 Extract the downloaded MID Server archive file into your <mid_server_name> folder. Find the <parameter name="url" value="https://YOUR_INSTANCE.service-now.com"/> element and change the value to the URL of your ServiceNow instance. Enter the MID user credentials you created earlier in the mid.instance.username and mid.instance.password parameters. Find the <parameter name="name" value="YOUR_MIDSERVER_NAME_GOES_HERE"/> element and change the value for the MID Server name. Use the same name you’ve used form the <mid_server_name> directory earlier. (Optional) Enter connection information for the proxy server. Remove the appropriate comment tags from the proxy configuration information. For example, you can configure the mid.proxy.use_proxy, mid.proxy.host, mid.proxy.port, mid.proxy.username, and mid.proxy.password. 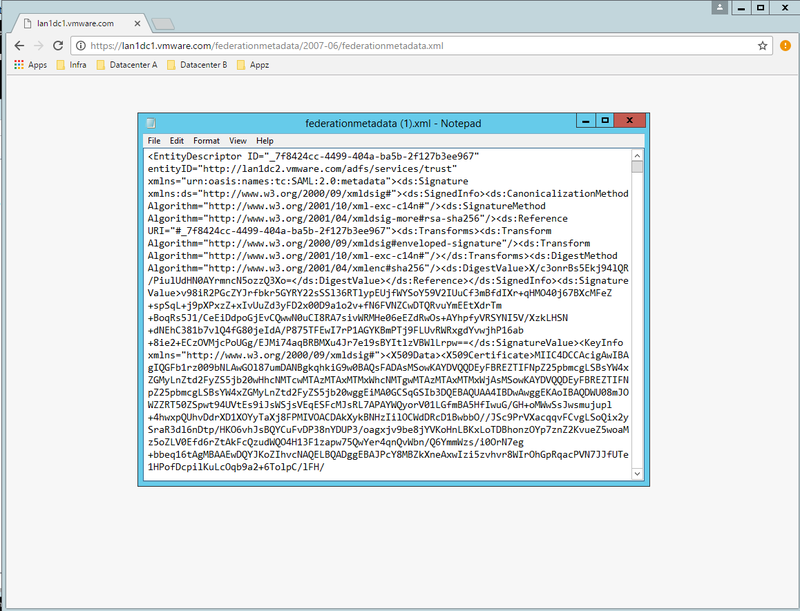 Log in to the ServiceNow instance identified in the config.xml file. Navigate to MID Server > Servers. Alternatively, if Discovery is installed, navigate to Discovery > MID Servers. Verify that all MID Servers connected to this instance are listed. 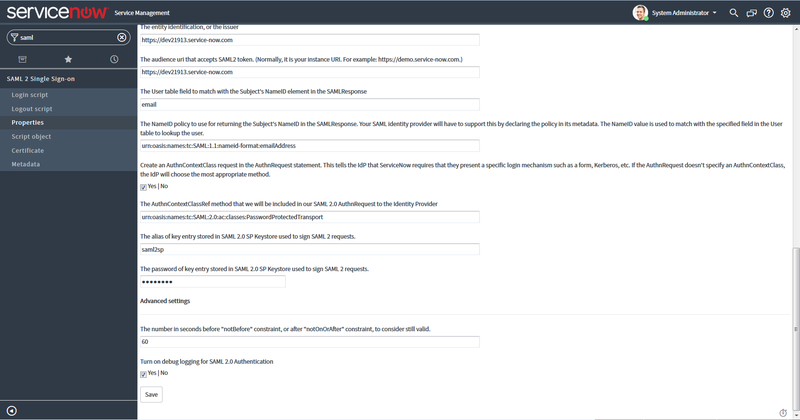 Select the MID Server name and under Actions on selected rows… select validate. The MID Server should now show as validated. This section covers how to configure ADFS Integration with ServiceNow. In the search field type SSO. Verify that the SSO Provided by Okta, inc plugin is active. Configure properties for the ServiceNow identity provider. As a ServiceNow system administrator, enter SAML in your Filter to navigate to the SAML Single SignOn. Select Properties to configure SAML sign on properties. Select the Enable external authentication check box. Open the ServiceNow federation metadata file that you downloaded, and use the appropriate information from the file to populate text boxes on the SAML 2.0 Single Sign-on properties page. The Identity Provider URL which will issue the SAML2 security token with user info. The base URL to the Identity Provider’s AuthRequest service. The AuthRequest will be posted to this URL as the SAMLRequest parameter. The base URL to the Identity Provider’s SingleLogoutRequest service. The LogoutRequest will be posted to this URL as the SAMLRequest parameter. For most systems, you can accept the default. SignLogoutRequest. Set this property to true if the Identity Provider’s SingleLogoutRequest service requires signed LogoutRequest. Configure ServiceNow Service Provider properties. Keep defaults for all fields not listed in the following table. The URL for the ServiceNow instance home page. The audience uri that accepts SAML2 token. The User table field to match the Subject’s NameID in the SAMLResponse. The NameID policy to use for returning the Subject’s NameID in the SAMLResponse. The SAML identity provider must support this by declaring the policy in its metadata. The NameID value is used to match with the specified field in the User table to lookup the user. 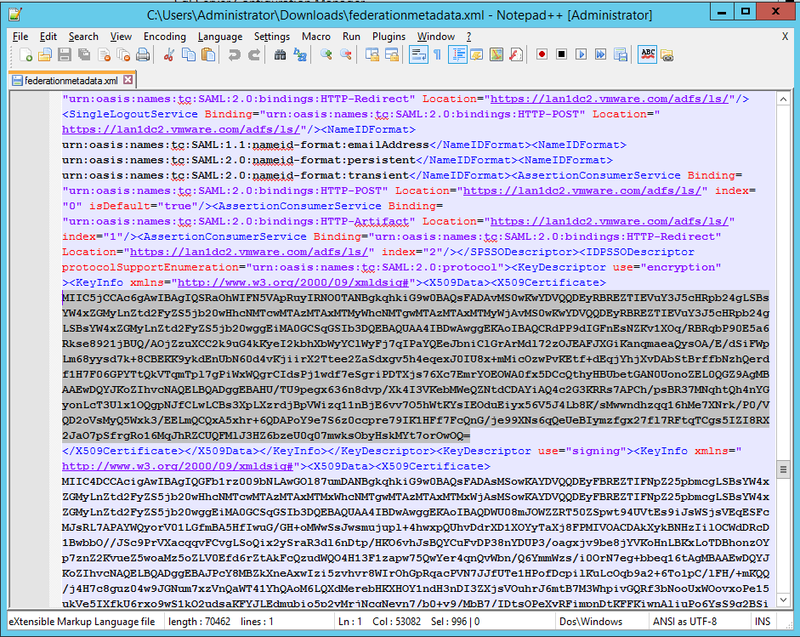 Navigate to the IDPSSODescriptor KeyDescriptor signing x509Data section of the FederationMetadata.xml file. 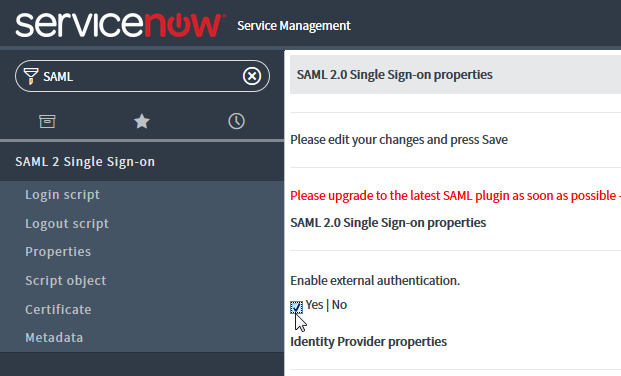 Login to ServiceNow and navigate to SAML 2 Single Sign-on > Certificate. Click on the SAML 2.0 certificate. Paste the certificate you copied earlier between the —–BEGIN CERTIFICATE—– and —–END CERTIFICATE—– lines. Select again the SAML 2.0 certificate. Click the Validate link at the bottom of page to validate your certificate. 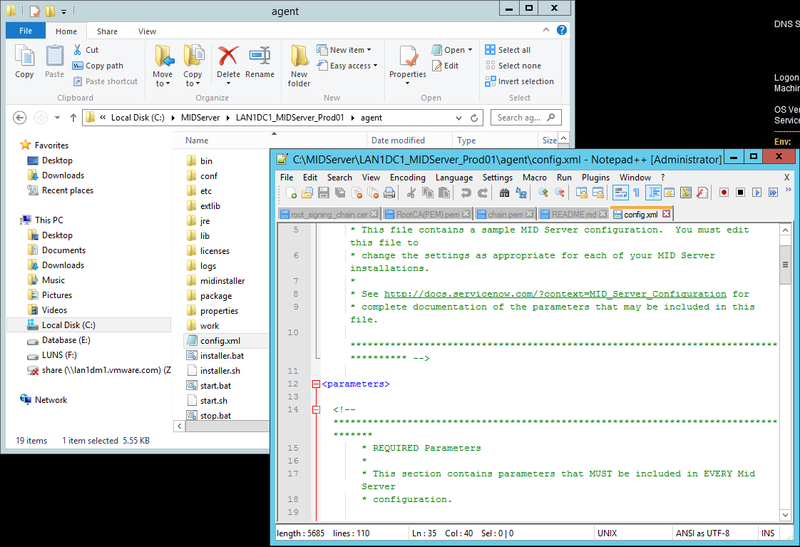 Click the Metadata link in the SAML plug-in menu and copy the metadata content to an xml file: for instance, servicenowInstanceName-metadata.xml. Log in to your ADFS server by opening Administrative Tools and finding the ADFS console link. 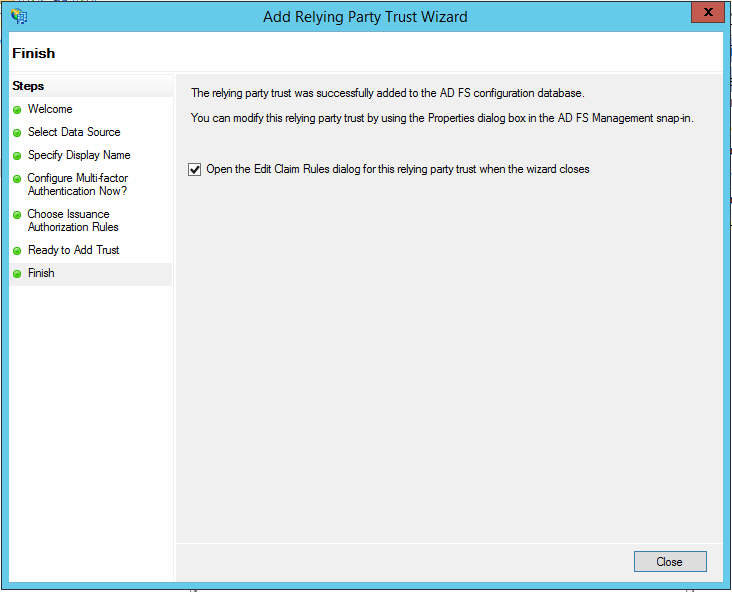 Open the ADFS 2.0 Management console and select Trust Relationships > Relying Party Trusts. 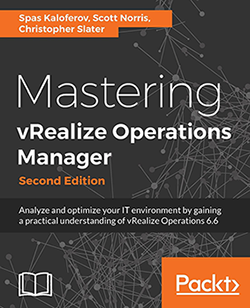 Click Start on the configuration wizard. 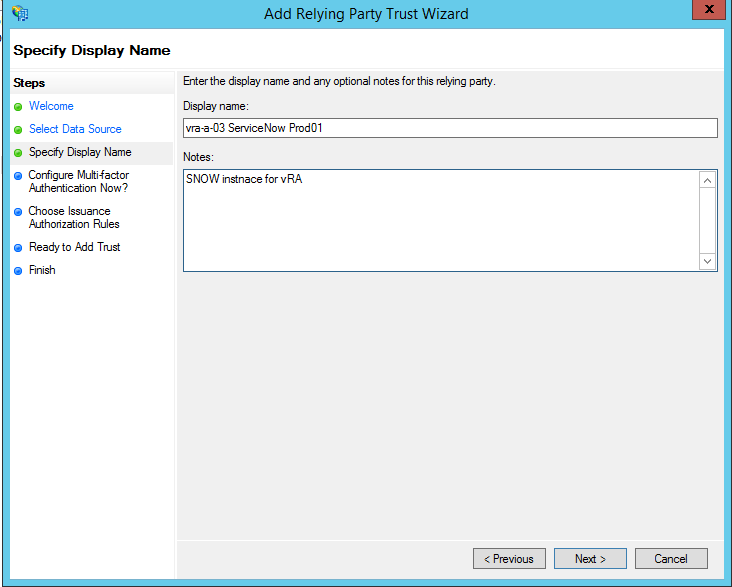 Select Import data about the relying party from a file on the Select Data Source page. 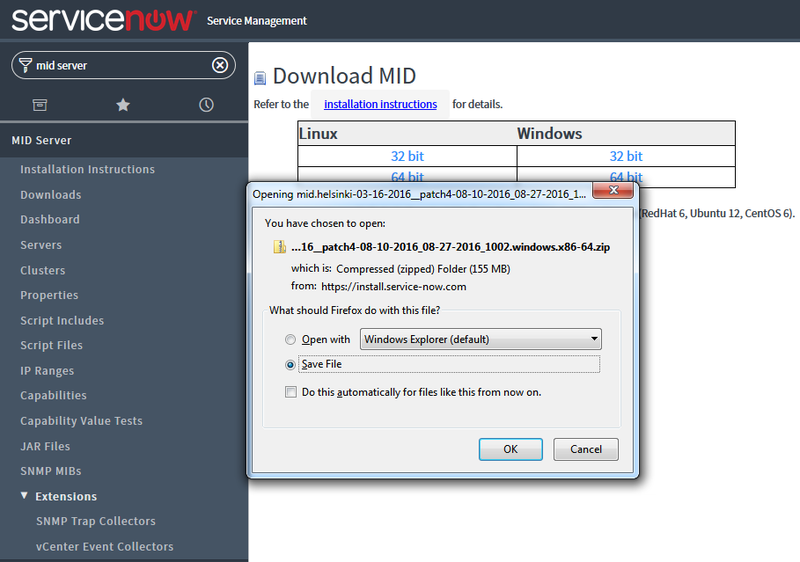 Import the ServiceNow metadata file that you copied and saved previously from the SAML configuration metadata section. 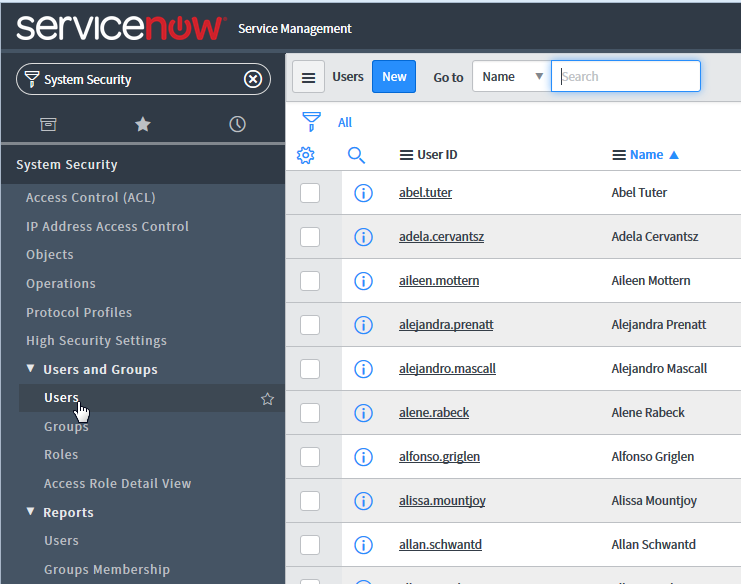 Enter the name for your ServiceNow instance in the Display text box on the Specify Display Name page. On the configure Multifactor Authentication Now? Page click Next. 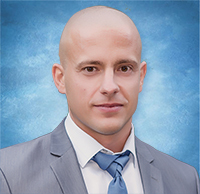 Select Permit all users to access this relying party on the Choose Issuance Authorization Rules page. Click Next on the Ready to Add Trust page. Click Close on the Finish page. When configuring ADFS integration for ServiceNow, you must set up the appropriate claim rules to control the behavior of incoming and outgoing claims. 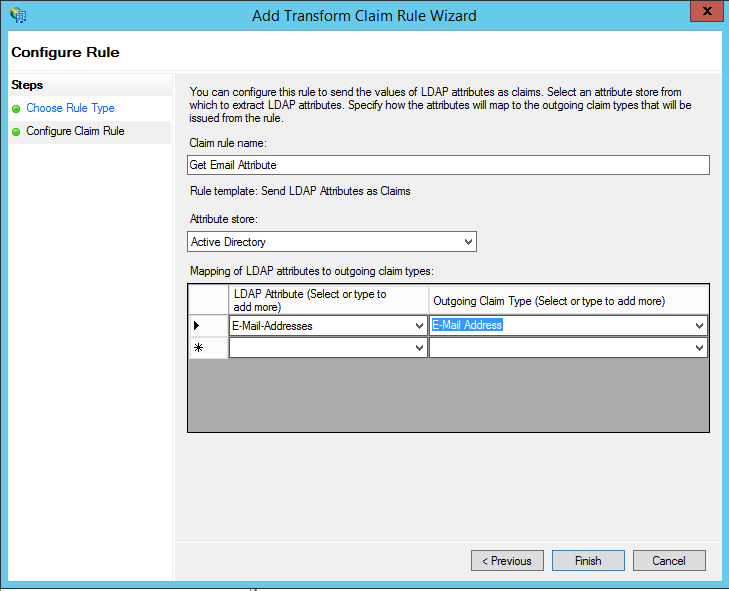 This section covers how to configure Claim Rules for ADFS ServiceNow integration. 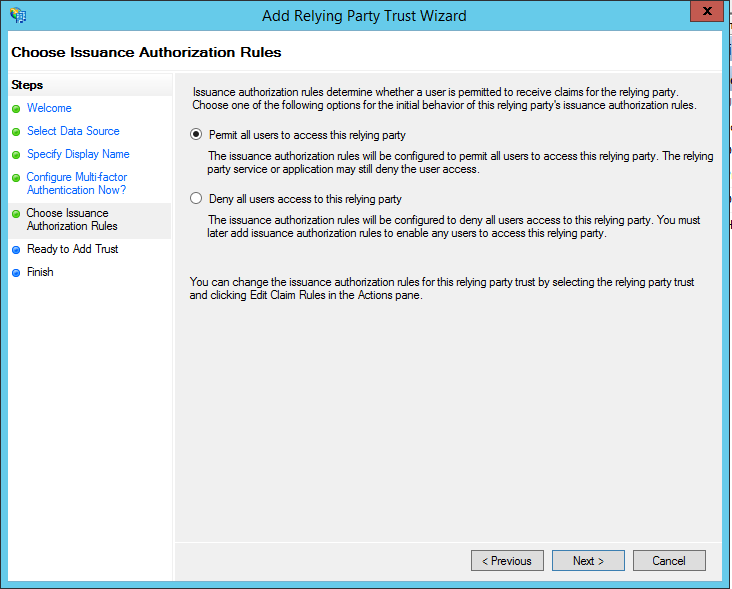 Right click the relying party trust that you created for ServiceNow, and select Edit Claims Rules. 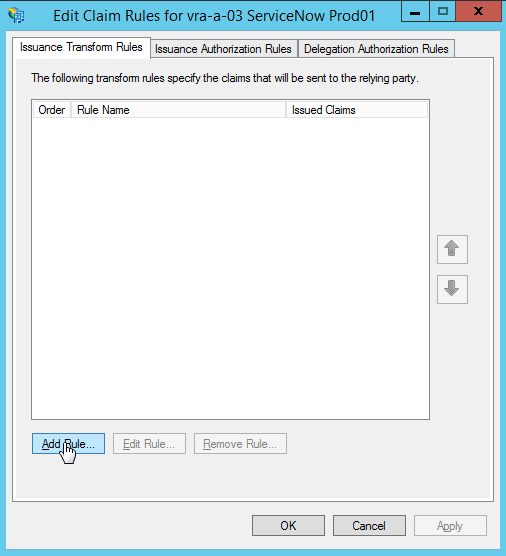 Select Add Rule on the Issuance Transform Rules tab. 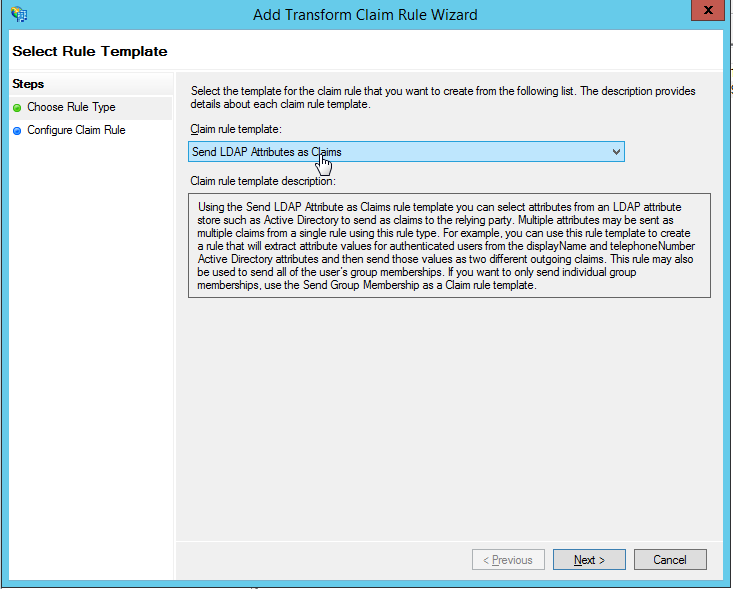 Select Send LDAP Attributes as Claims as the template for the claim rule to create. 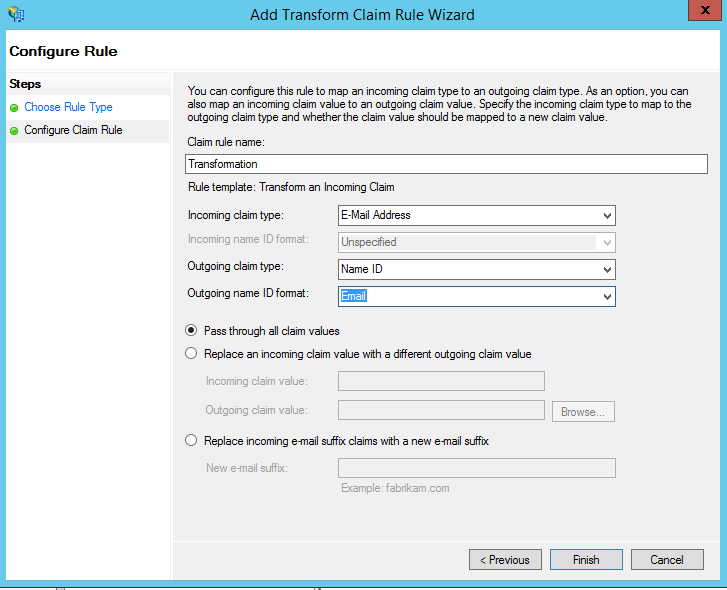 Enter the name Get Email Attribute in the Claim rule name text box on the Configure Claim Rule wizard page. 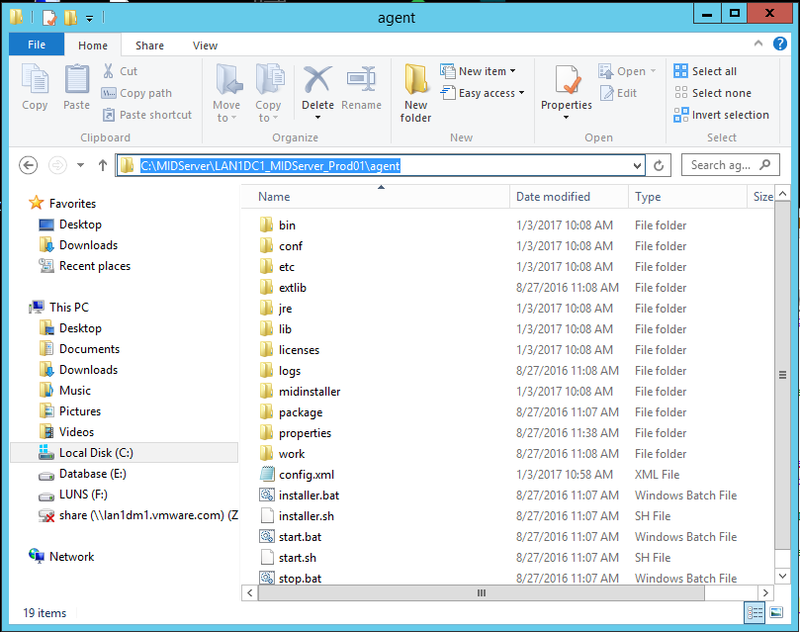 Select Active Directory as the Attribute store. 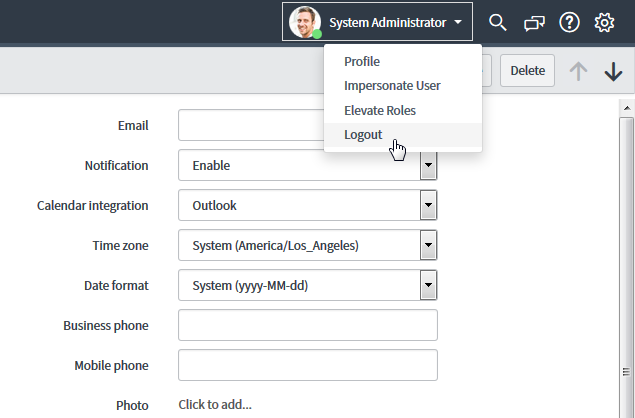 Select the email addresses for LDAP attributes and the Outgoing Claim Type using the E-Mail Addresses drop-down in the Mapping of LDAP attributes to outgoing claim types section of the page. You must add a rule that transforms the attributes received from LDAP in the Get Email Attribute rule into the desired SAML format. 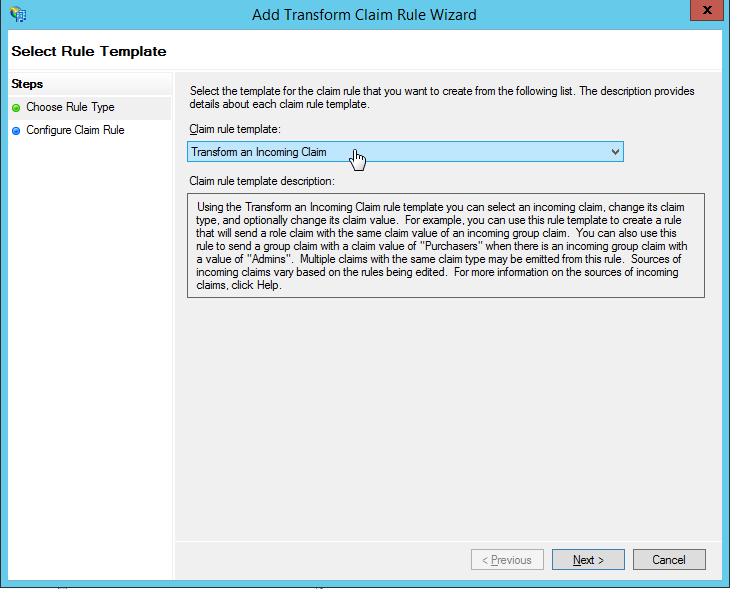 Enter the name Transformation in the Claim rule name text box on the Configure Claim Rule wizard page. Select E-Mail Address for the incoming claim type. Select Name ID as the outgoing claim type. Select Email as the outgoing name ID format. Select Pass through all claim values. 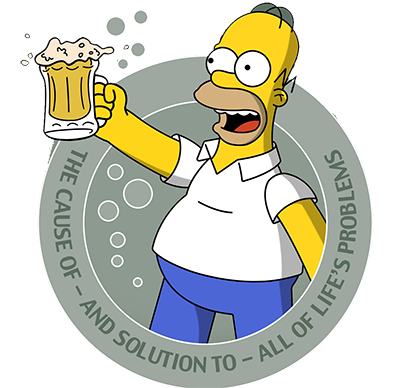 If all went well, go grab a beer. This entry was posted in ITSM Plugin, ServiceNow, VMware, vRA and tagged catalog, cmdb, integration, itsm, plugin, servicenow, SKKB1038, snow, vmware, vra, vrealize automation. Bookmark the permalink.